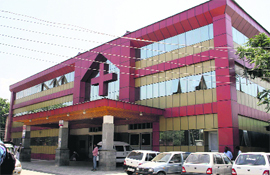 Emergency healthcare at one of the Valley’s major hospital, Shri Maharaja Hari Singh (SMHS) Hospital, has been badly affected on weekends especially on Sundays as no senior doctors or consultants is available here even to attend to serious cases. In separate cases, the police found the bodies of two men at Pattan and Leh areas today. 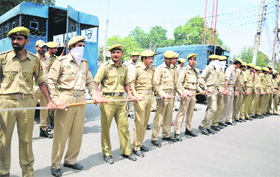 The police said the body of Shamshad Alam of Champaran in Bihar, was taken to the District Hospital, Pattan by his colleagues. Gusty winds and heavy rain over past two days has damaged standing paddy and maize crop, vegetable fields and orchards in different parts of north Kashmir leaving the farmer community high and dry. 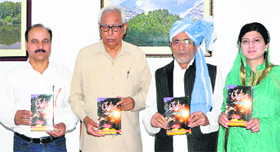 Governor NN Vohra released a book on a play 'Bedaari' at a function held at Raj Bhavan here today. A delegation of the Kashmir Traders and Manufacturers Federation, Srinagar, met Governor NN Vohra here today and presented a charter of demands to him. Over a dozen People's Democratic Party (PDP) workers were detained by the police when they tried to take out a march against the state government for its alleged failure to scientifically manage the Achin garbage dumping site. Two persons were killed and 18 others were injured in different accidents across the Valley today. The police said Shamas-ud-din, a resident of Budgam at Shat Tulail, Bandipora, was hit by a Tata-make vehicle. He died on the spot. A case has been registered in this regard. 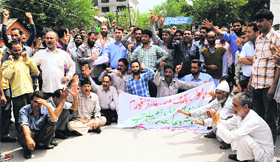 Members of the Urban Local Bodies Employees United Forum (ULBEUF) courted arrest after staging a protest here today. They were demanding regularisation of services. Terming the situation at Achin garbage dumping site as grave, the High Court has directed the Advocate General to take up the matter with the Chief Secretary in order to expedite the installation of modular Leachate Treatment Plant and setting up of new plants of additional capacity at Achin. Various Sikh organisations, including J&K Sikh intellectuals circle, Sikh Students' Federation, Jammu and Kashmir Sikh League and Sikh Welfare Front, have expressed serious concern over the alarming tension on the LoC between India and Pakistan and have linked it with the non-resolution of the Kashmir issue. Additional Special Judge, Anti-Corruption, Kashmir, today convicted Altaf Ahmad, a former junior engineer (JE), Mechanical Irrigation Division, Sopore, and sentenced him to undergo a rigorous imprisonment for a period of two years and a fine of Rs 20,000. The J&K Academy of Art, Culture & Languages today organised an on-the-spot painting competition for children of various schools. Irked over the pathetic condition of drinking water, residents of Bijbehara town in south Kashmir's Anantnag district took a delegation to the chief engineer of the Public Health Engineering (PHE) Department, earlier this week in Srinagar. The wildlife conservation fund, an organisation working for the conservation of wildlife, in collaboration with Government Polytechnic for Women, Srinagar, organised a workshop titled ‘National Workshop on Wildlife Conservation’ in Srinagar on Wednesday. Naseema Naqash, mother-in-law of People’s Democratic Party (PDP) leader and former Finance Minister Tariq Hameed Karra, passed away here today. She was also the mother of PDP leader Asia Naqash. The mass adventure awareness camp was organised by the Green Valley Educational Institute (GVEI), Elahibagh, Srinagar, for its 170 students and 15 teachers at Sonamarg which concluded on Wednesday. A group of attendants alleged that last Sunday, when they had taken a severely injured girl to the SMHS Hospital for treatments, they only found a group of interns there having no clue on how to treat the patient. “Ours was not the only case. Many seriously ill patients come to the hospital even on weekends. The availability of senior doctors is necessary round-the-clock at a major hospital of the city. However, SMHS Hospital has been unable to do so in the emergency care,” Shahid Khan, an attendant from Soura, Srinagar, alleged. He said because of lack of seriousness on part of the senior staff members, even junior doctors did not take patient care seriously, which was unjustified. “We had brought a severely injured girl to the hospital. However, to our shock, the group of interns present showed no responsible attitude, they brushed us aside and discussed among themselves on how to treat the girl. What are poor patients and attendants supposed to do other than to look for costlier Private hospital options,” Shahid asked. A 24-year-old student, Imaad, was also allegedly ignored by the junior doctors and interns on Sunday had asked the patient to come back on Monday. Deputy Medical Superintendent, Dr Kamal Jeet, said the allegations were baseless and the availability of at least one consultant (senior doctor) was ensured on all days, including Sundays. “Our consultants work in shifts. We usually let the consultants arrange their schedules so that patient acre is not hit. There is a separate consultant to check the wards and one especially for the emergency care," Dr Kamal Jeet said. The deceased worked at the Indistrial Training Institute, Pattan, as a labourer. In another incident, the body of Yountan Nurboo, a resident of Choglamsar in Leh, was found hanging at the forest Bagh near Choglamsar Bridge. The police has initiated inquest proceedings in both the cases. In Lolab valley of Kupwara district, farmers said rains and hailstorm had badly damaged paddy and maize crops. They said the rains had also hit fruit orchards and vegetable fields. “Paddy, maize, fruit and vegetables suffered extensive damage due to wind storms and rains. At some places, gusty winds had flattened standing crops," said Mohd Ramzan, a farmer from Midanpora village of Lolab valley. “The paddy and vegetable fields are submerged in rain water. We have lost everything to the natural disaster. Un-seasonal rains have already affected the crops and fruit,” he added. The worst-hit villages in Lolab include Maidanpora, Devar, Lalpora, Dardpora, Muqam, Sogam, Warnow, Doban, Shalgund, Krusan and Khurhama. Incessant rains and strong winds have also affected crops, vegetables and fruits in parts of Handwara and Baramulla. The worst-affected areas include Rajwar, Bakiakar, Kasloo, Rafiabad, Kahipora, Magam, Kanispora, Sangrama, Watergam, Dangiwacha, Ladoora, Mazbugh, Hadipora, Tangmarg, Wagoora, Kreeri, Sheeri, Sopore, Rohama and Rafiabad. "We were expecting a bumper crop this year but incessant rains over the past two days have affected more than 70 per cent of crops. The authorities should assess the loss and extend compensation to the farmers," said Mohd Amin from Rajwar. The fruit industry is the mainstay of the economy in north Kashmir. Orchard owners said the storm had knocked the apple, pear and cherry crops to the ground. "Gusty winds also broke down the twigs of apples and other trees and knocked down the wall nut on the ground. Crops suffered massive damage due to hailstorm and incessant rains," said Shabir Ahmad, a fruit grower in Sopore. The farmers appealed to the authorities to compensate for the losses caused due to the natural disaster. "The natural calamity wreaked havoc on fruit and crops in large areas across north Kashmir. We make a fervent appeal to the authorities to assess the loss and compensate it on compassionate grounds," said Haji Ghulam Ahmad Lone, a fruit grower. A senior official said teams of horticulture and agriculture visited many affected areas in Handwara and Lolab to assess the loss caused. "At some places around 50 per cent loss has been reported," he added. The play has been written by Parvez Manoos, a known author from the state in the Pahari language. The Governor emphasised the need to take required measures for the promotion of various languages and literature in the state. He also highlighted the importance of books and literature being produced in various languages of the state, especially comics. He assured his support for such innovative initiatives. The Governor complimented Manoos for his laudable contribution for the enrichment of Urdu and Pahari languages and wished him continuing success in his literary pursuits. Manoos spoke about his work. Earlier, Syed Mushtaq Ahmad Bukhari, Chairman, J&K Pahari Culture and Welfare Forum, in his welcome address, thanked the Governor for taking keen interest in the socio-economic advancement of the people of the State, particularly Pahari speaking people. He felicitated the Governor for his active association with the affairs of the state. Recalling the prime demand of the Pahari speaking people, Bukhari urged for the Scheduled Tribe status being given to them without any further delay. The demands presented by the delegation included provision of adequate compensation and appropriate rehabilitation of the shopkeepers whose establishments were being affected by various road widening schemes and the Jehangir Chowk-Ram Bagh Flyover project in the city. They also sought transparent and effective implementation of the state government's amnesty scheme for the one-time payment of electricity arrears payable by the consumers. While raising issues about functioning of the J&K Bank, the delegation stressed on the importance to ensure greater transparency in its recruitment processes, not leaving any scope for favouritism and nepotism. The Governor said the issues raised by them would receive due attention. The delegation comprised Haji Mushtaq Ahmad Darial, chairman of the federation; Haji Advocate Mushtaq Ahmad Sagar, president of the Federation; Bashir Ahmad Wani, secretary general; Peerzada Sahid Jeelani Makhdoomi; chief organiser; Hilal Ahmad Mandoo, publicity secretary; Nissar Ahmad Mir, senior vice-president; Abdul Rahim Fafoo, finance secretary; Ghulam Rasool Shah, publicity chief; Haji Altaf Dar, Sheikh Zahoor Ahmad and Mushtaq Ahmad Kulla, advisors; and Ghulam Nabi Wakeel, chief spokesperson. Navin K Choudhary, Principal Secretary to the Governor, was also present on the occasion. 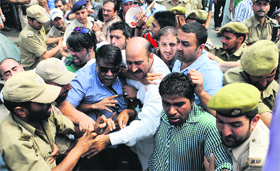 PDP leader Khursheed Aalam, led the protest. The protesters were on way to the Deputy Commissioner Srinagar's office from Sher-e-Kashmir Park to present a memorandum when they were stopped by the police near Lal Chowk. The protesters carried placards and banners asking the government to take care of the Achan site which had become a nuisance for the thousands of residents living around it. “The Achin site has become a nuisance for the people living around the area and we want that government should take steps to ensure that unbearable stench emanating from Achan landfill site should stop,” a protester said. As the protesters reached Lal Chwok, a large contingent of the police stopped them and asked them to disperse. When they refused, they were detained and taken to the Khotibagh police station. Aalam was also detained by the police. Most of the PDP workers were later released. In another accident, Sajad Ahmad Khan, 22, of Khud Gujjar, Devsar, was injured after he was hit by a Tata Sumo. The victim was taken to the Public Health Centre (PHC), Devsar, where the doctors declared him brought dead. In another accident, a Tata passenger vehicle overturned near Humhama, Budgam, leaving 15 passengers injured. The police said an SUV hit a pedestrian Akhtar Ahmad Mughal, a resident of Dachna Salamabad, Baramulla, near the Courts complex Boniyar, Baramulla. No case has been registered in this regard. The protestors, carrying banners, gathered at the Press Enclave area and raised slogans in favour of their demands. President of the forum Manzoor Ahmad Pampori regretted that their repeated pleas “fell on deaf ears”. He said they would intensify protests if the government failed to address their demands. Stating that the ULBEUF members had observed a strike in Budgam and Ganderbal districts today, Pampori said they will announce a “decisive protest programme” on August 31. Stating that they were being forced to stage regular protests, he appealed to the authorities concerned to address their demands at the earliest. The demands of the ULBEUF include implementation of service recruitment rules, release of 20 per cent arrears under the sixth pay commission, setting up of a transparent transfer policy within the department and regularisation of daily wagers and consolidated employees having more than 15 years service in the department. The forum is also demanding a time-bound settlement of pension and commutation cases besides timely release of salaries. The Joint Consultative Committee (JCC), an amalgam of various government employees' bodies, took part in the protest. It has further directed the state government to devise a formula to achieve the desired results at the earliest and avoid the situation getting out of control. The disposal and the management of garbage in Srinagar has witnessed a face-off between different government agencies. In this regard, the operation of the Leachate Treatment Plant at Achin garbage dumping site has become a bone of contention between the J&K Economic Reconstruction Agency (ERA) and the Pollution Control Board (PCB). While as the ERA maintains that the existing Leachate Treatment Plant is operational, the PCB, in its latest inspection report to the court, has said that the Leachate Treatment Plant at Achin garbage dumping site has not been fully installed, adding that a small reverse osmosis (RO) system was found in place during the inspection carried out by the PCB scientists on August 27 and 28. The PCB in its report has further said that RO system is only a part of the Leachate Treatment Plant, which involves a complex scientific process. The chemical and biological processes have not been installed, which is pre-requisite for proper and complete treatment of the Leachate,” the CB has further said in its inspection report. On the other hand, in its fresh report to the court today, the J&K ERA admitted that the existing treatment plant is insufficient to treatment the leachate. It, however, said the modular Leachate Treatment Plant for clearing the backlog would be operational by October 15, while suggesting the installation of two plants with additional capacity. However, the petitioners represented by counsel Zaffar Qureshi opposed the granting time to the ERA for installing modular plant by October 15. He said the existing plant had a capacity of only 30, 000 litres per day, while as the total daily production of leachate is between 70 to 80 thousand litres. He said if things continue to remain as such, the situation by October would get out of control. Observing that the situation at Achin was grave, the Bench today asked the advocate general MI Qadri to take up the matter with the chief secretary. “In order to expedite the installation of modular Leachate Treatment Plant with additional capacity and two additional plants, some formula may be devised to achieve the results at the earliest and to prevent situation turning further grave,” the Bench said in its orders today, while asking the Advocate General to file a report in this regard by tomorrow. During the previous hearing on August 20, the PCB had mentioned that the Leachate Treatment Plant was not operational at the Achen site, whereas the CEO of the ERA had said that the plant was made operational. The Bench had directed the PCB and the CEO ERA to visit the Achen garbage dumping site along with petitioners to resolve the controversy over the operation of the Lechate Treatment Plant and submit their reports by August 29. It had also expressed its displeasure over the non-implementation of court orders and the callousness exhibited by the state government authorities in implementing them. The bad odour emanating from Achen site has spread to other parts of the Srinagar city. According to a press release, a joint meeting of these organisations was held here today under the chairmanship of Narendar Singh Khalsa wherein it was resolved that any forced solution or bilateral solution imposed on the people of Kashmir against their wishes would be jointly opposed by Sikhs. The meeting appealed to the world community to ensure the implementation of the United Nations resolutions on Kashmir to accomplish permanent peace between India and Pakistan and in the south Asia. Sikh organisations also demanded disbanding of the VDCs as their criminal activities and biased role have created communal tension and sense of insecurity among the minorities in some parts of Jammu region. The JE has been convicted for the commission of offence punishable under Sections 5(2), 5(1) (c) of J&K, Prevention of Corruption Act 2006. A case was registered at the police station, Vigilance Organisation, Kashmir, on January 25, 1999, and it was proved during the investigation that the accused had taken 53, GI pipes of 4” diameter for digging the tube wells in 1993 and never deposited the said pipes in the store of the department. “The value of the said pipes was amounting to Rs 1.84 lakh. A challan was produced before the court on December 19, 2002. After a trial, the court has convicted the accused and sent him to the Central Jail, Srinagar for undergoing the sentence,” an official spokesman said. Academy secretary Khalid Bashir Ahmad, who inaugurated the event at Lal Mandi here, said the competition was being held to promote the talent and provide platform to the children for testing their hands in fine arts. Students of 23 schools participated in the event and participants were divided into two groups-senior and amateur-an official said. “The event evoked enthusiasm among the students-both boys and girls-who participated in large numbers. The Amateur Group included the students in the age group of 17 to 20 years and the senior group had students in the age group of 11 to 16 years,” the official added. A panel of painting experts will judge the works of the students and the winners of the competition in each group will be given away prizes at a function which would be held later. In the amateur group, winners will be given a first prize of Rs 1,400, second prize of Rs1,000 and the third prize of Rs 800. In the senior Group, the first prize carries a cash reward of Rs 1,000, second prize of Rs 700 and three consolation prizes of Rs 500 each. The participating schools included Presentation Convent, Rajbagh, Mallinson Girls School, Sheikhbagh, Burn Hall School, Sonawar, Model High School, Jawaharnagar, Government Girls Higher Secondary Institute, Kothibagh, Srinagar British School, Nowgam, MET Secondary Educational Institute, Bagat-e-Barzulla, Linton Hall School, Rajbagh, National School, Karan Nagar, Simin Rose Garden Montessori School, Bagat-e-Barzulla, New Convent High School, Rajbagh, and others. According to residents, their repeated pleas to local officials of the department have fallen on deaf ears since more than two years now. "Fed up with the cold response of local officials, we decided to send some elders to the chief engineer's office," said Rayees Ahmad, a local resident. He said a group of five persons carried along the samples of the water they had been receiving for the past two years. "The Chief Engineer, Muzaffar Ahmad Lankar, was furious when he saw the water quality," said Ghulam Qadir, a local elderly, who was a part of the delegation. He said the officer, besides assuring them to take due cognisance of the matter, immediately contacted the local officials concerned and ordered them to take an immediate action. "We have been told that the issue would be solved on a fast-track basis and we have our fingers crossed," said Javaid Ahmad, another member of the delegation. Pertinently, residents of the town have been complaining of muddy water supply. The event was supported by Sanctuary Asia, India’s leading wildlife magazine, Save Hangul Campaign and Adobe Youth Voices, USA. College principal Mohammad Shafi Bhat appreciated the efforts of the wildlife conservation fund, and promised all possible support in the future as well. The event was moderated by Nadeem Qadri, environmental lawyer and executive director, wildlife conservation fund. He appreciated the role of the college for facilitating the national workshop on wildlife conservation. He welcomed the support rendered by the college to make this event possible. The PDP has condoled Naseema’s death. Conveying deep condolences on the death Asia Naqash's mother, party patron Mufti Mohammad Sayeed and president Mehbooba Mufti expressed their deep sympathies with the bereaved family and party leader Tariq Hameed Karra. They also prayed for eternal peace to the departed soul. The concluding ceremony was observed with different adventure activities performed by the students. During the concluding function, senior teachers of the GVEI and office-bearers of the Jammu and Kashmir Ski and Mountaineering Association (JKSMA) felicitated the participating children. Among others presidents of the Adventure Tour Operators Association of Kashmir and Travel Agents Association of Kashmir, Rauf Ahmad Tramboo was present on the occasion. During the camp, students were imparted basic skills of different adventure activities like white water sports, boating, trekking and hiking, river crossing, orienteering and zipline. Students visited several villages at Sonamarg, including Nilgrath, Sonamarg, Sarbal, Shutkari and Gujjar colonies at Thajewas to know about the ethnicity and culture of people. Students also trekked to upper reaches of Thajewas, Luderwas and Shaukhdaran ranges. The students were given lectures on the preservation of wildlife and ecology and allied sciences. Some slide and video shows were also organised during the camp. The team also engaged themselves in the garbage collection at Sonamarg. The J&K Ski and Mountaineering Association extended its full support to the institute in organising the camp successfully. The association provided technical support to the institute. Many highly trained instructors were engaged for imparting training under the supervision of its president Mohammad Yusuf and secretary general Rauf Tramboo. JKSMA general secretary Rauf Tramboo expressed his gratitude to all those who extended their support and help in making the event a grand success, particularly the District Development Commissioner of Srinagar, Farooq Shah, and District Development Commissioner of Ganderbal, Sarmad Hafeez, Director Tourism, Kashmir, Talat Pervaiz, Sonamarg Development Authority CEO Mohammad Yousuf, Hatrick Group chairman Shoukat Choudhry and teachers who accompanied the students. Tramboo also expressed his thanks to GVEI chairman Mohammad Yusuf for sponsoring the event which was first of its kind in the Valley.